In my presentation this morning I will continue the line of thinking started by Brian Haratsis but explore some subjects from a different perspective, taking close account of randomness and uncertainty when discussing the future. Each of these topics will be posted separately in sequence as a 3 part essay. The world is changing and the pace and magnitude of change is accelerating – a feature of human development marked by Alvin Tofler’s famous book ‘Future Shock’ published more than 40 years ago. Twenty five years ago on 9 November 1989 the Berlin Wall came tumbling down and the contemporary post Cold War era began. In the intervening quarter century, Europe has built a continental single currency economy, the US economy has almost doubled, the Australian economy has grown by over 500% and the Chinese economy has expanded from $413 billion to $10.3 trillion. Today we are projecting forward for an equivalent period attempting to anticipate the major factors and likely events that will shape the world. In that period we will see more change than has ever occurred in human history leaving one to wonder whether, with so much uncertainty and dynamism, we should bother to plan at all. The riposte is an oft cited quote from Benjamin Franklin who evidently said that if we fail to plan, we plan to fail – and no delegate at this conference wants to do that I am sure. At the same time it would be prudent of me when discussing the future to include a few serious qualifications. Most musing about the future inevitably reflects the interests of the speaker, particularly the vested interests they might represent – whether that be commercial or political. And then there is that apt caution by British mathematician Alfred North Whitehead about “the fallacy of misplaced concreteness”. So often conjecture is presented as empirical fact, opinionated guesswork is dressed up with a veneer of expertise to denote certainty. To further underline the assertion that nothing about the future is certain, inevitably I refer to the highly influential book, “The Black Swan”, which drew attention to humankind’s poor track record in accurately anticipating the future or utilising probability theory to manage risk. Inevitably, it seems, the things we see as being highly improbable end up happening and we normally don’t see them coming. These are the un-predicted Black Swan events which its author Nassim Taleb described as “large-scale unpredictable and regular events of massive consequence that have been principal shapers of human history”. A corollary observation in the Black Swan is that we don’t learn very well even from past experience. The frequency of Black Swan events in history are cautionary reminders of the fraught nature of forecasting and managing the future based on experience or observation. Look no further than falling oil prices to see how well we see the future. “Oil prices have fallen effectively 30% in three or four months, which has surprised us all and been far faster than we, or anyone else expected”, SANTOS Chief Executive David Knox was reported as saying in late November – and there would be few people in Australia better positioned than Knox to have an inside view on energy markets. It is difficult not to conclude that a different way of thinking is required for the prudential exploitation of the risks and opportunities that make the future. And crucial to improving the quality of our thinking and problem solving when discussing the future is to understand that what we don’t know is more important than what we know. So instead of attempting to predict the future, today I propose to put up some ideas relevant to getting our heads around what might be the course of the next 25 years. In that context I hope we can explore how in our different roles and regions we might achieve sustainable development. “Reports that say that something hasn’t happened are always interesting to me, because as we know, there are known knowns; there are things we know we know. We also know there are known unknowns; that is to say we know there are some things we do not know. But there are also unknown unknowns — the ones we don’t know we don’t know. And if one looks throughout the history of our country and other free countries, it is the latter category that tend to be the difficult ones”. Typically when asked to apply this intelligence diagnostic to future economic development in our respective regions and constituencies, most present the broader world with a brochure view of their organisation, locality or region. The “known knowns” are the things we know and generally want other people to know about us. We saw it this morning when Northern Territory Chief Minister Adam Giles came in and gave an upbeat speech about the development prospects of the Territory. He gave us the verbal brochure. When thinking or workshopping about the future or some new development most organisations tend to stay on the left hand column of the cognitive dilemma matrix. There is almost an instinctive inclination to go straight down to the known unknowns ie those things we know we don’t know because it is there most of us confidently believe will be found the source of smart competitive advantage, the new widget, the new commercially boosting idea and so forth. In our search for competitive advantage we so often we skip right past a great body of knowledge already resident in our organisations, local communities and regions – knowledge that is simply overlooked, under-utilised or lost to our corporate or civic memory. I call that the “unknown known” in economic development – and a lot of it is tacit knowledge that is taken for granted and never commercialised – for example skills and experience in places like Gladstone where they iterate between boom and bust construction cycles but never quite capture and commercialise all the technical knowledge that comes with building and operating some of the most complex industrial infrastructure in the resources and energy sectors. 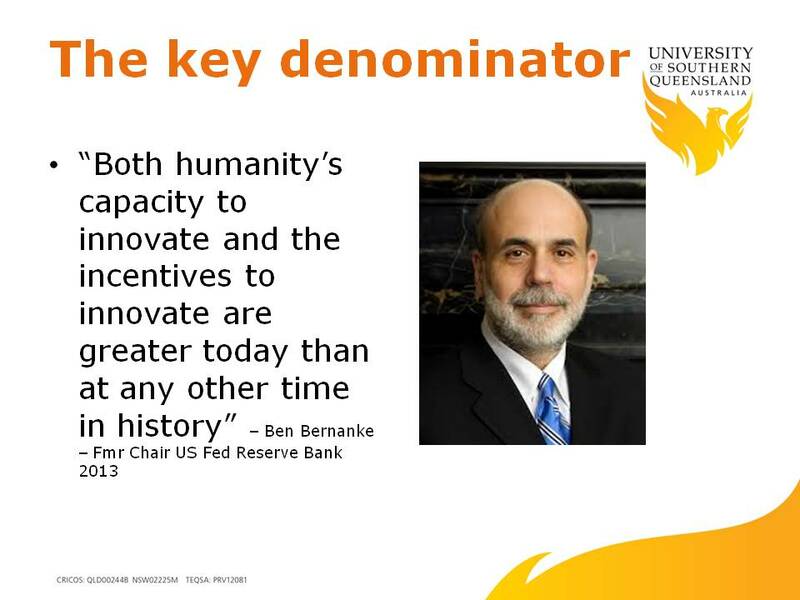 Equally, the unknown knowns in economic development can be things known to foreign investors or newcomers to the sector or region that do not share the history, perceptual (including prejudices) and experiential inhibitions (possibly blinkers) evidenced in existing enterprises or communities. A current example is the Chinese interest in our dairy industry and their farm productivity expectations which are quite different to the Australian view. 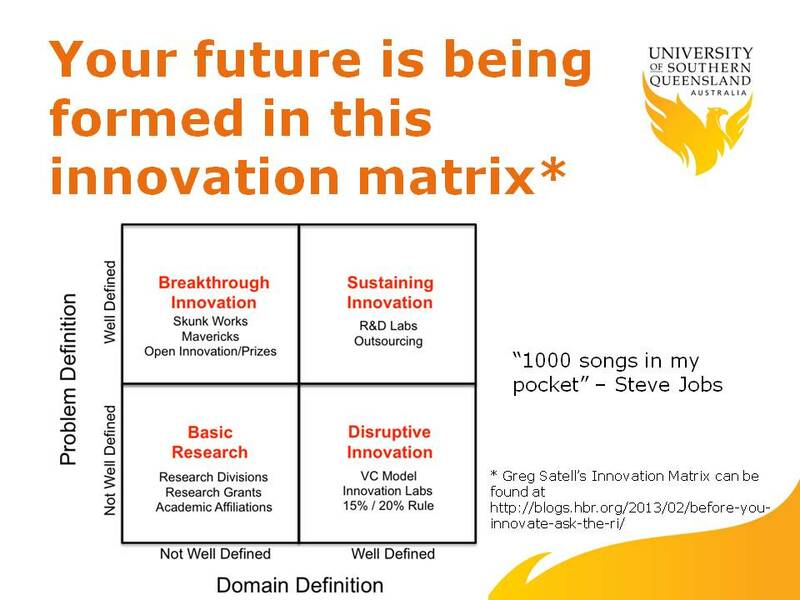 The most exciting and potentially most dangerous quadrant for the future is, of course, the ‘unknown unknowns’. In shaping the future it is the most important of all the quadrants, because in this “black” area anything can happen. But it also holds the promise of the invention of technologies, skills and capacities potentially transformative of human experience on this planet – and for that matter potentially transformative of the prospects of Earth itself. In a future where lots of different things can happen, scenario analysis presents a useful tool, not to predict the future, but to organise factors into comprehensible systems so that their interaction can be modelled, understood, and anticipated – if certain catalysts or prerequisites fall into place. Royal Dutch Schell did this so well with the OPEC oil crisis in the 1970s and then later with the breakup of the Soviet Union. Scenario analysis is a good way to research and understand change. 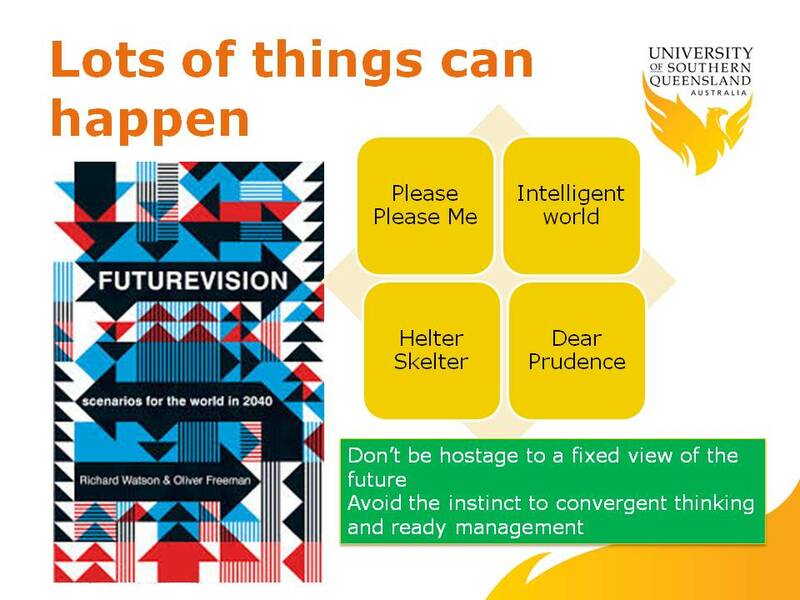 These four scenarios presented in a book by Richard Watson and Oliver Freeman called “Futurevision: scenarios for the world in 2040” are all very credible – but they are just four scenarios among any number that might be developed – all tracking back to ‘now’. This is what all scenarios have in common – the present as their common portal to us. Scenarios are not necessarily preferred futures, but they are plausible. Watson and Freeman present four scenarios as case studies for further instruction in scenario development and interpretation (which is a good thing about their book). Their scenarios reflect different drivers for future development built around a range of values, resources, trends, and decisions taken between now and 2040. Scenario development reminds us not to be captured by any fixed view of the future and also in our thinking to avoid the corporate instinct toward early convergence or convenient agreement so that we can all get on with managing things. Brian Haratsis has already reminded us today of the limits to what can be done with trend analysis – pre-conceptions can distort analysis and linear projections take little account of disruptive interventions. Too often we confuse thinking with planning and planning with action or implementation. In the western culture particularly, we don’t like to think too much about the future. We’d rather be busy and organised – hence the short-termism that permeates our culture. So in plotting out the different scenarios your organisation, community or region might entertain, please avoid the rush to agreement and attempting to “manage the un-manageable” ie those things that are still in formation or are not yet known. Conversely, there is also a need as Gary Mulgan, a onetime senior adviser in Tony Blair’s office, has suggested, for thinking and planning beyond the short almost myopic vision of the vast majority of elected politicians in this era. The leaders of the western democracies particularly seem preoccupied with time frames of days, months and at most an electoral cycle. 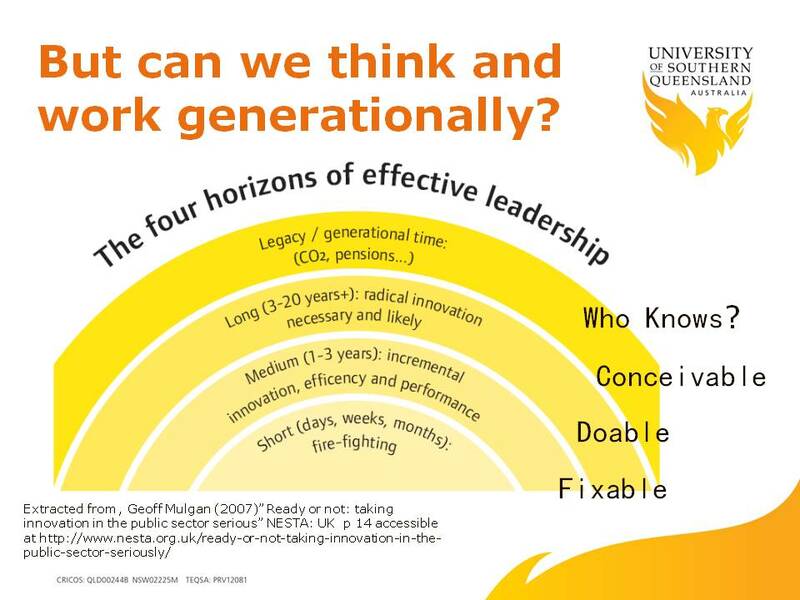 Indeed, the question can be asked: “Are we capable of long term or inter-generational vision and acting on that vision? Or is it, in the modern political world of spin, ‘announcables’ and short media cycles and immediate kudos, simply inconceivable? Sadly, in Australia our private sector investment culture is pretty much the same, particularly in public companies where investors want to take earnings as dividends and not enable capital accumulation for reinvestment. We are more likely to succeed in the future if we look first to establish innovation enablers for preferred pathways rather than trying to manage everything that conceivably could come our way. The thing about choices is to make them when they need to be made and not beforehand. Choices also have to be based on a plausible platform of potentiality – something I was reminded of in a recently published book: “Scarcity: why having too little means so much”. One of the core themes explored by authors Mullainathan and Shafir is the limits of “cognitive bandwidth” in an individual and social sense. 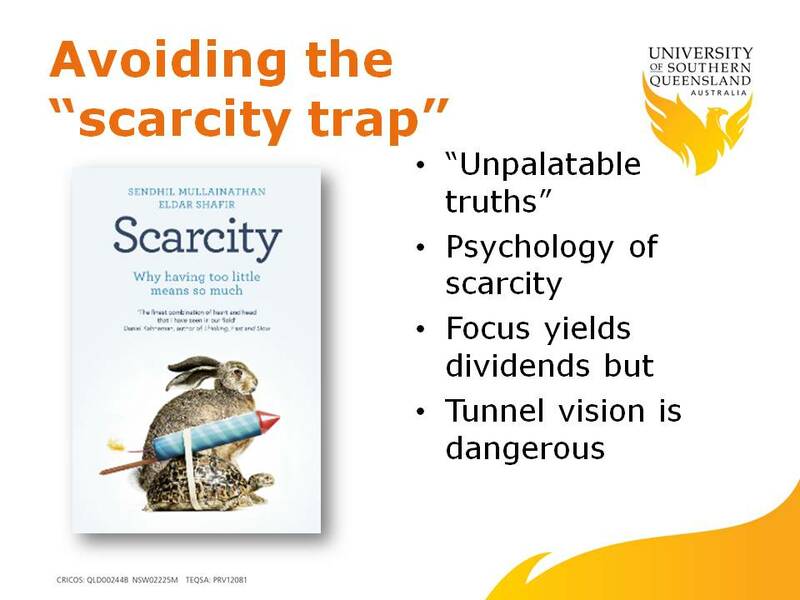 Just as we talk about digital bandwidth, the authors (an economist and a psychologist) show how scarcity, whether it is of resources or time, impacts on our decision-making, resilience and capacities. Their key message is that focused attention and thinking yields dividends but take it too far and tunnel vision eliminates opportunities, distorts trade-offs and ignores potential threats. Scarcity generates its own cognitive contexts and constraints, meaning that poorer communities and regions wanting to be more prosperous are most likely to achieve positive steps by being open-minded and practical at the same time. Closing off potential future development options and pathways is the dilemma facing resource straitened communities, particularly when anything seems better than the status quo. There is a risk of irrationality in decision-making that comes with scarcity which can also apply to the development aspirations and planning of regions and communities. An example might be a mine that brings immediate jobs and an influx of workers, but in the process cuts off options in tourism and agriculture. Conversely, there could be examples where the reverse might be true, that is, the better option would have been a long term mining operation instead of Struggle Street in some other sector. The point here is that resilient communities are not single-mindedly focused communities that tunnel past opportunities and in doing so become critically path-dependent. There is a limit to the value of focus. Daron Acemoglu and James Robinson revealed in “Why Nations Fail: the origins of power, prosperity and poverty” that critical path-dependent development can generate vulnerability in leaving communities and societies without options. Too much success in one activity or function within a successful regional socio-economic system, perversely, can breed complacency and inertia, strengthen incentives against change, and lead to a weakening of adaptive capacity in affected communities. Today Australia provides a prime example of this tendency with the primacy and power of the resources sector and the increasing economic dependence on commodity exports and the rise of China. As Professor James Laurenceson from UTS pointed out recently, the Australian economy is being reshaped, some might say distorted. In the five years following the GFC to 2013, Australian exports to China rose by nearly $64 billion but our exports to everywhere else fell by nearly $22 billion. Our growing dependence on China accounted for one fifth of Australia’s GDP. 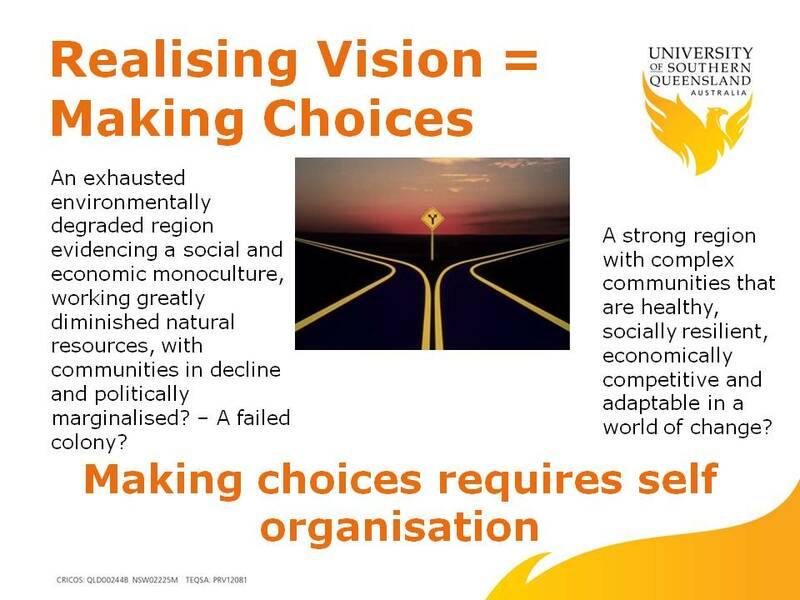 To realise a vision an individual, enterprise, community or even a nation has to be in a position to make choices. Communities and economies without choices are not resilient and have no future. Making choices involves self-organisation which in itself is a critical component of resilience as is self-determination. Can we go beyond resilience? A few months ago when reflecting on the different examples of regional development across the globe, the UNE’s Professor Tony Sorenson pointed me to Nassim Taleb’s other big book. 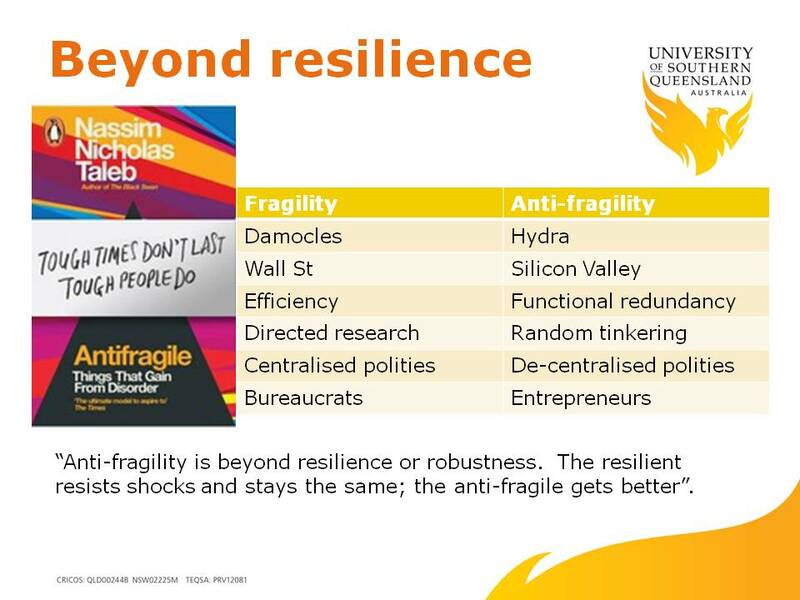 It is called “Antifragile: things that gain from disorder”. I did not know it at the time but Tony was actually asking: “Is resilience actually enough, is there something beyond resilience which we should be aiming for in regional strategies? the constraints of the bureaucratic approach versus the entrepreneurial vision. How would we use this framework of stark opposites to inform our thinking about regional development? Are existing approaches to regional development too prescriptive or formularistic? I suspect Taleb would argue there is good reason to ask the question, because he sees “modernity” and the quest to manage and control everything creating fragility and atrophy in our personal, social and economic systems. In contrast to the robust disorder in natural or organic systems, modern attempts to control and ensure certainty in human societies are spawning a protectiveness that is actually harmful. Natural evolution is a volatile, stressful, uncertain process which essentially delivers anti-fragile outcomes – not regions or communities which rely on transfers from other places and peoples to survive. I think the message we can take from this as it relates to today’s discussion about economic development presents as a series of questions. Will it make us more fragile and critical path dependent? What are the down-stream plays? Where do they wash out to? What are the key variables that play in our part of the world? Are there parts of our local system that benefit from stress, volatility, and uncertainty? Complexity is breeding unpredictability in our world and pushing the possibilities further to the edge. But in the day to day world of business and government, planners and policy makers ignore the fringe areas of the probability spectrum in which are to be found the real vehicles of change. So in attempting to create meaning is much of our effort in fact illusionary? Are the trend lines on graphs, for example, showing data from the past 15 years of much use at all in projecting images of the future? Three years ago, the orthodoxy in Australian economic forecasting was that we were entering a decade long “super cycle boom” in resources exports because of sustained ever escalating demand from Asia. How wrong was that? In late 2014 sector leaders are calling the wider commodities market the worst its been in 25 years and BIS Shrapnel is expecting mining investment to contract by as much as 40% over the next four years. Delegates, you do not have to look far to see that there is a random rather chaotic alternative future to the orthodox “certainty” predicted by the social and economic forecasters, the futurists and for that matter those historians adventurous enough to turn their discipline on its head and posit at the future. Look no further than modern health care. Many of the major medical pharmaceutical breakthroughs including penicillin, bupropiuim, warfarin, quinine, insulin, and viagra were all serendipitous discoveries and not the purposeful outcome of millions of dollars of directed research investment. There is a bureaucratic managed way of looking at life and history and there is an alternative entrepreneurial creative approach. My suggestion is that to capture the best opportunities in the future we will have to be far more innovative, and to be that Australians will have to be more entrepreneurial and look further beyond what they already know for the possibilities. Right now your future is being formed in the various quadrants of this innovation matrix, most likely in the right hand entrepreneurial column versus the left hand column which is characterised by the directed “managed”” bureaucratic investment. Steve Jobs, by the way, popped up in the right hand column. He was someone who could specify a need “1000 songs in my pocket” and end up with the IPod. Here was disruptive innovation running right across the conventional music industry, displacing all the predictions about mass cultural behaviours – and no one really saw it coming. 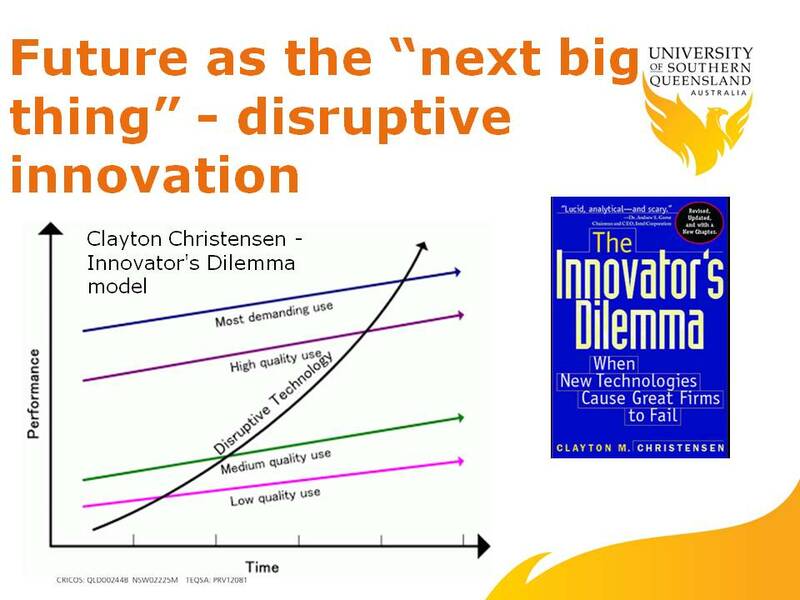 In fact this is the thing about disruptive innovation – so often it starts as something sub-optimal, sometimes mis-cued or even mis—focused in its application. Examples include the Smart Phone, Amazon.com, and 3-D printing. In a relatively short time, however, the disruptive innovation’s quality and appeal takes a quantum leap forward, in the process transforming behaviours and markets – as the Uber app is doing right now to the highly regulated taxi industry. So there you have it – my rather long list of caveat points as we look at the world out to 2040. Over recent times, however, many have begun to wonder whether they can make a difference to the world around them. A core question going forward for us all then will be how we generate leadership, discussion and action generating of civic ownership and initiative that shapes the future. The content of future vision is important, but even more important is the presence of personal empowerment and social enablement to make possible its achievement. Prev Are we up to the challenge of reforming the Australian Federation? Hello, very interesting blog. I was wondering if you would expand your explanation of Knowns / Unknowns. I’m a political science student and it is interesting to think of this framework in terms of threats that a nation faces. So, maybe known-knowns are things like another country’s standing army and conventional weapons. Known-unknowns are maybe things like another country’s advanced weaponry capabilities and future intentions. Unknown-knowns would be threats that we subconsciously or purposely ignore (? I don’t really understand this). And unknown-unknowns are things that a state can’t predict but may arise at any time (like terrorism?). Can you comment on this kind interpretation of the “Rumsfeld Dilemma”? It seems to me that countries are most focused on known-knowns and known-unknowns in terms of security policy… but I don’t really know. I wonder how security alliances would affect this dilemma…. So much going on here! Michael – thank you for your note. This matrix derives from a cognitive psychology tool, the Johari Window – about which you can find freely much information using any search engine. The ‘known knowns’ are things about a subject freely or widely known. I call it the “brochure view” because it tends to be the material people, organisations, nations want to present about themselves and which is freely available. 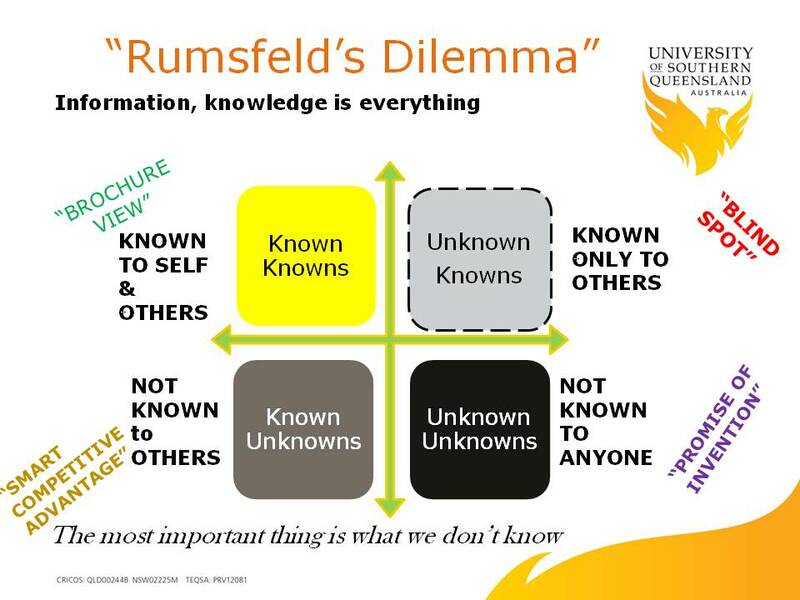 The Unknown-Knowns are the things we dont know ourselves but are known about us or the topic of our point of interest/focus by others(including potentially competitors and rivals). Its the so-called “blind spot” we don’t see without feedback, insight, intelligence etc from others. And you are right we can choose to ignore this consciously or subconsciously by too narrowly relying on particular sources of information and analysis that fall within our own control. We can only get access to this perspective by collaborating with others and relying on inputs beyond our own control because it is a perspective that comes from outside our system – whether that be person, organisation, region, country or security pact.